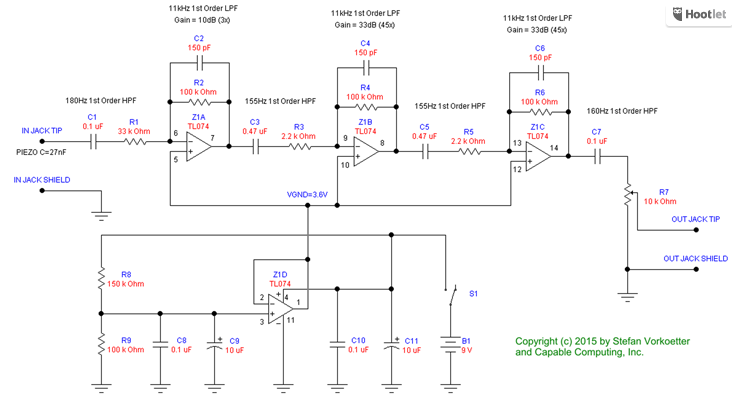 Watch-o-Scope provides a schematic of a circuit that amplifies frequencies within a set band to filter out noise. and, yeah, the j is an imaginary number. 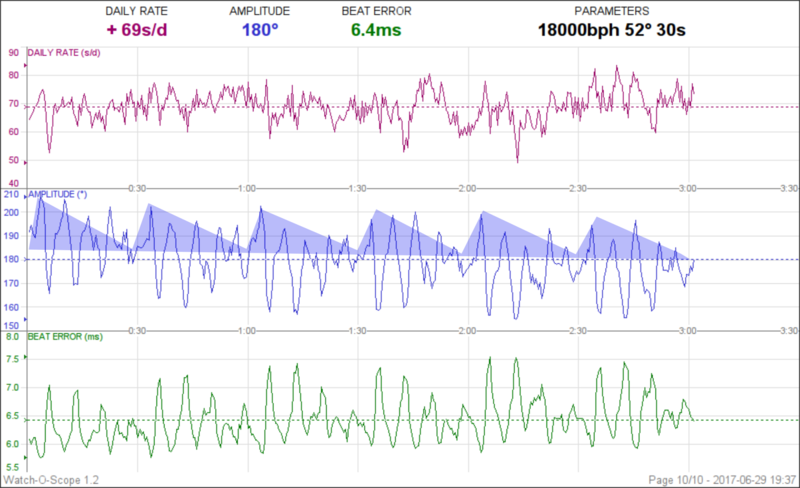 You can see that as frequency increases, Zf decreases. 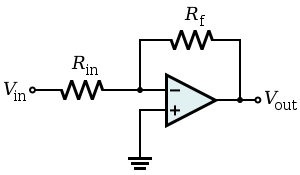 In turn, gain decreases with increasing frequency, thus, we have a low pass filter. 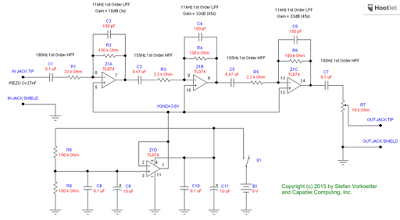 So that gain increases with increasing frequency; a high pass filter. Put it all together and we have a high-gain, band pass amplifier. Most of the important sounds appeared to fall in the range of about 2000-5000 Hz. I had to widen the band, however, for some of my wristwatches. So what can we learn from a watch timer? This trace of my 1957 Bulova 23 Jewel, shows the watch is relatively accurate, relatively clean and with a low beat error. 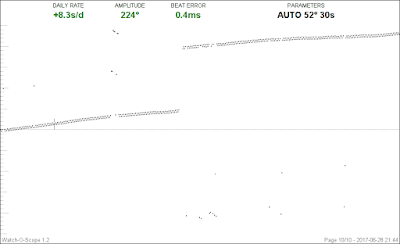 Perfect accuracy means a daily rate of 0 seconds per day of gain/loss and would show as a series of dots (ticks) perfectly overlaying the horizontal line in the middle. For an old watch, 8 seconds per day is arguably tolerable. An amplitude of 224° rotation of the balance (270° is ideal), combined with a fairly straight, fairly noiseless trace, suggests a clean and well-lubricated watch. 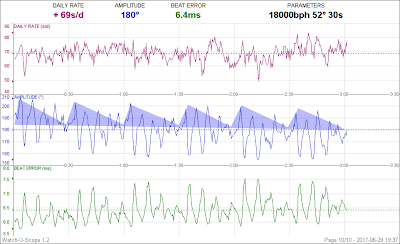 And the beat error, the difference in the amount of time the balance spends rotating in each direction, is minimal. By taking a longer-term trace, we can discern periodic fluctuations point to flaws in the rotating gears of the watch, called the wheel train. 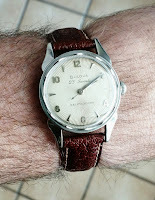 The same Bulova 23 over a 3 hour period is enlightening. 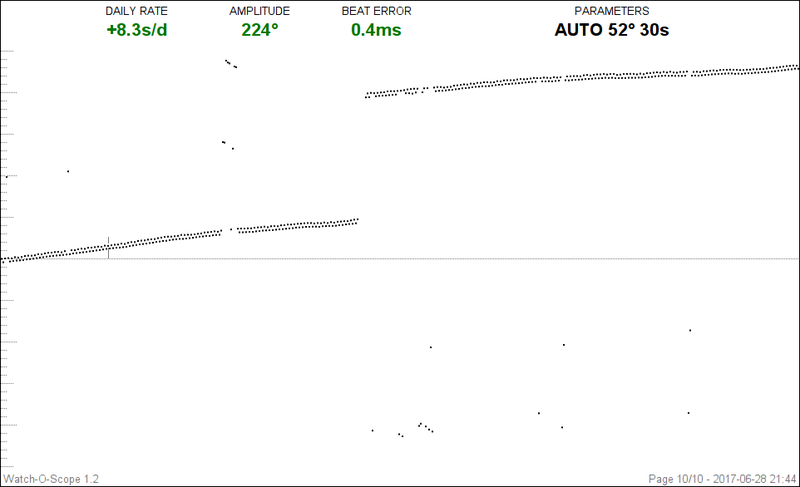 The trace above shows fluctuations in amplitude and rate occurring about five times an hour. Until I learn more about the movement I won't know the cause. Meanwhile the blue shading I added highlights an hourly variation that may point to issues with the center (hour) wheel. The slight overall downward trend in amplitude may be due to the main spring unwinding. And with that, I now have a suitable circuit for diagnosing my various mechanical watches.